KHL.ru and its analysts present you the best players in the league in January. The best players were determined by well-known analysts. Alexander Fomichyov – Russian Championship bronze medal holder and former national team netminder – selected January’s top goalies. 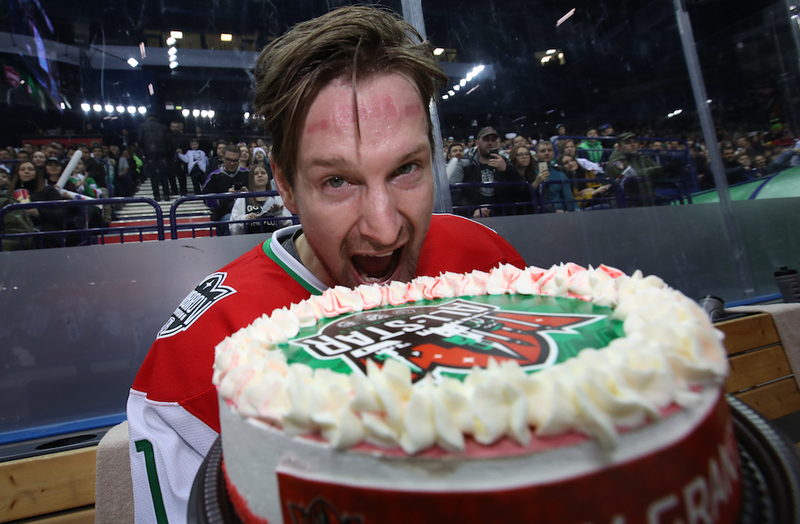 Alexander Guskov – world champion and Olympic Games bronze medal holder – selected January’s top defensemen. KHL TV analyst Artyom Batrak picked January’s top forwards. Ilya Konovalov played almost all Lokomotiv’s games in January and became the undisputed team’s number one goalie, dethroning the famed Alexander Salak. If compared with last year, Konovalov became calmer and plays with a bigger confidence. Dmitry Kvartalnov is clearly practicing him in sight of the playoffs, which will constitute a real test for the young goalie. Today, Konovalov is the prime candidate for a call in the national team, and I’m not talking about the Euro Hockey Tour, but the IIHF World Championship. If no goalies from the NHL will join the team, Konovalov will most likely be one of the three goalies to represent Russia in the tournament. 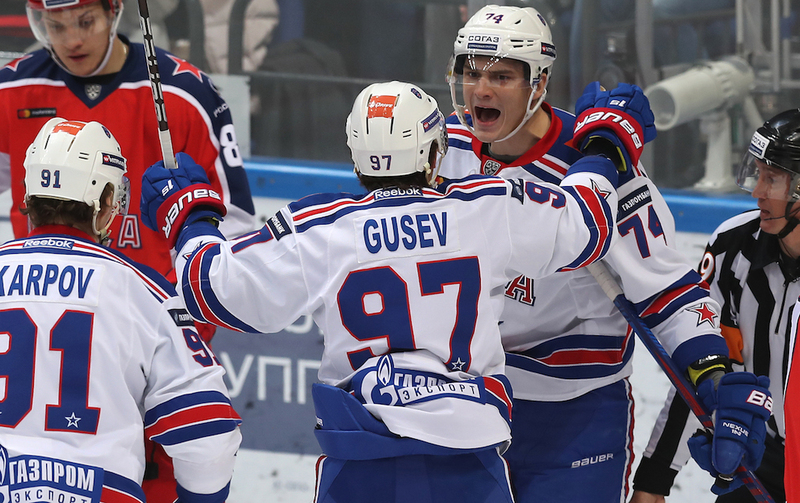 Traktor had a rocky start of the season, but the new head coach Alexei Tertishny put some order in the team’s defensive game and the goalies enjoyed more success as well. Vasily Demchenko is not as his first season in the League, but this year he’s playing his best hockey. In January, he posted two shutouts, looked very confident and helped his team to gain some traction in sight of the upcoming playoffs. I’m sure that Demchenko will start the playoffs as Traktor’s first option in net if nothing strange happens. 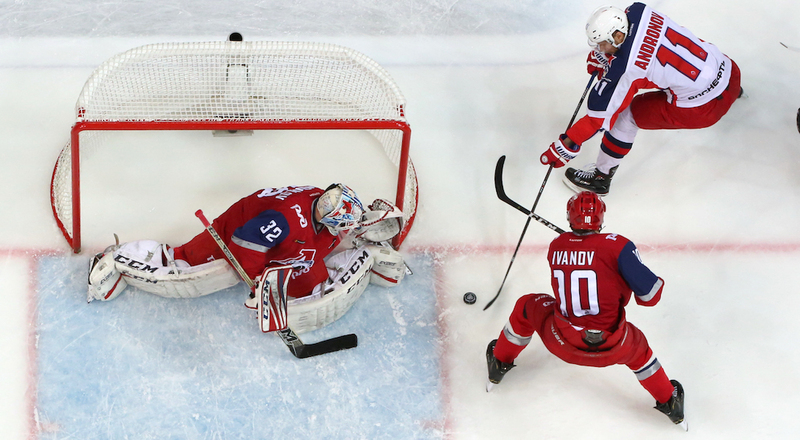 The demand is high in the KHL for international players, and they are heavily scrutinized. And Cody Franson’s success did not go unnoticed. 10 points in 9 games means more than one point a game. This defenseman is a great mix of size (196 cm, 102 kgs) and mobility. The Canadian player is simply irreplaceable with the man advantage as he has a great shot. Moreover, his shot isn’t his only weapon: he can complete crisp and accurate passes, which is uncommon for defensemen. It can be safely said that Franson is one of the best players for Avangard. The Jokerit defenseman can be compared to Cody Franson, they have a similar style. Alex Grant is pretty big (191 cm, 95 kgs), very useful in the powerplay, and shoots right, a thing that is rarely pleasant for goalies. Grant has a very good shot, but not only: he plays a very technique-sound game. Many times, this season – as he were a forward – Grant got the puck, entered the zone, defeated the opposition and scored. Grant is one of the best playmaking blueliners in the League, and it’s not surprising to see his name in the top 3 of the best-scoring defensemen with 31 (11+20) points. This season, Prokhorkin saw a significant increase of his average time on ice and is iced in the most important moments of any game. Naturally, this is also a consequence of Pavel Datsyuk’s reduced impact on the team. Now, Prokhorkin enjoys more trust from the coaches; it’s quite evident why Prokhorkin is producing much more this season. As a further testament, his 14 points in January are the second-best result in the League. Taylor Beck spent a significant portion of the season with Avangard, and not only he perfectly adapted to his new team, but he’s traveling at a point-per-game pace. Moreover, he’s scoring most of his games when his team needs them more, not when they are up 5:0. Playing under Bob Hartley, he already scored more points than what he did during his stint with Kunlun Red Star. Many may not agree at first with this pick, but just have a look at the way Admiral plays and how many points Butuzov scored this month. It’s tough to rack up points playing in a team which is always in the bottom of the standings. However, Butuzov in January managed to score six goals, five of them in three straight games. His election as last week’s best forward is only logical.